Looking for a way to increase the lead generation power of your online Calls-to-Action – then this post is for you! If you are struggling with low conversion rates or experiencing the pain of “Not Enough Leads” (ouch) and you’re looking for a way to increase the lead generation power of your online Calls-to-Action – then this post is for you. Included are some proven techniques to boost conversion. Before detailing these Calls-to-Action (CTA) tips for you, let me first explain why this is important. Visitors to your website who do NOT click – Do NOT convert. Simply put… The goal of highly converting CTAs is to cause folks to CLICK IT. Yes. CLICK IT is the TICKET to succe$$. Without clicks, there’s little or no engagement. This usually indicates an underperforming website that doesn’t maximize business revenue. Well, there is good news here. Fixing this engagement problem isn’t impossible or daunting. It requires you to listen up. Read this blog and be open to trying some or all of these tips to create highly converting CTAs. Before you start diving in to fix your underperforming website, take a step back and look at your home page. Then, ask 2-3 others who are NOT in your business to do the same. Have these “outsiders” (preferably not co-workers or family members) be willing to tell you their truth. Big Bold Daring Tip: Gain valuable feedback by asking a few ideal customers (target audience or buyer persona) to review your site’s home page. Then, after looking at your home page for 20 seconds or so, ask them what they would do next. Really listen to them. Ask them why they said what they said. As Stephen Covey writes in his bestselling book “7 Habits of Highly Effective People”, building the skills of empathic listening inspires openness and trust. Covey’s Habit #5 is: Seek first to understand, then to be understood. Listening to your ideal customers can be quite revealing. It will likely point to surprising disconnects between your intentions for your website and actual behaviors. Next, lets change some behaviors of site visitors by getting them more engaged. Believe it or not, one of the best ways to do so is to provide fewer choices. In our on-demand world of today with the Internet and billions of choices – most people are quite frankly paralyzed by overwhelming amounts of choice. When getting ready to make your meal choices from a menu at a restaurant, do the vast number of choices simply overwhelming you? It gets downright hard to choose from so many different options. At times I just get anxious and ask to go last as I deliberate about what entrée to get. So many choices and so little time! These overwhelming sensations sometimes hit me when I’m channel surfing my hundreds of TV show choices on my satellite TV service. Studies show that choice can be demotivating. One very intriguing example demonstrated that participants who were given six chocolates from which to choose one were happier with their selection than those who selected one chocolate out of 30 possibilities. This has been called the paradox of choice. Fewer CTA’s on your home page may actually make your site visitor feel less anxious and happier. This can lead to better conversion rates. Consider eliminating some CTA’s in order to provide clearer, simpler choices for visitors. 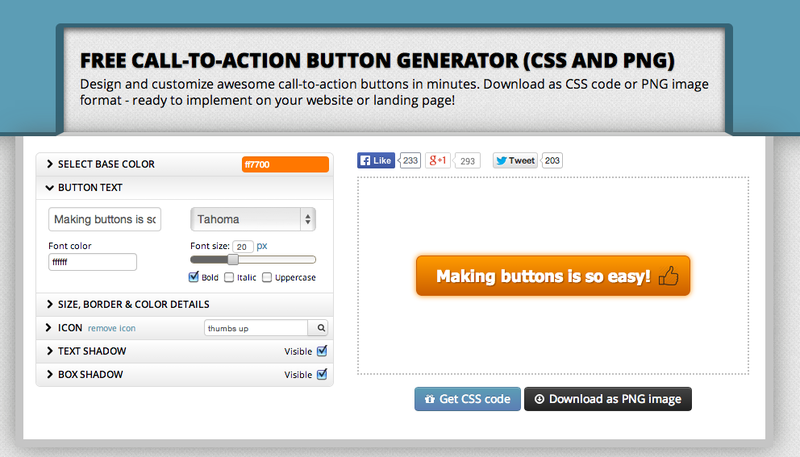 Two easy ways to enhance CTA results are to make the CTA buttons stand out. These may seem obvious to you. But too often they are ignored. 1) Make the button appear and look like a clickable button. 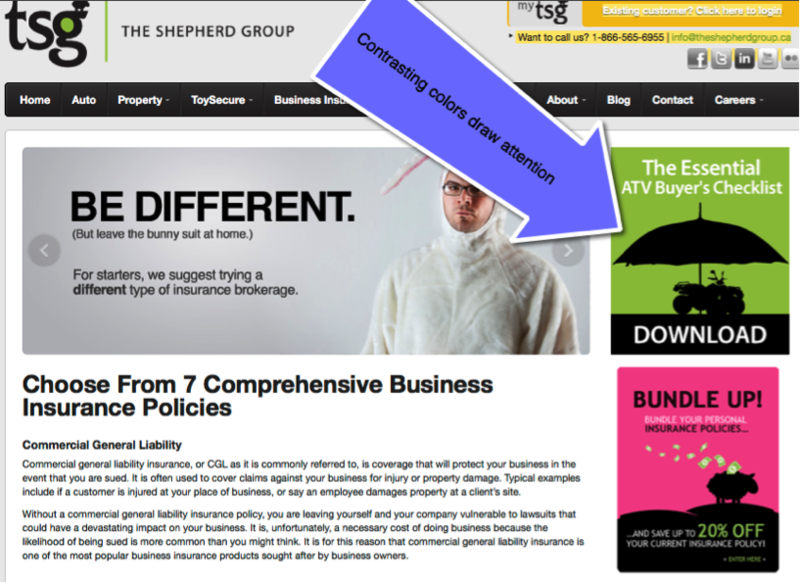 Too often websites incorporate an image or a graphic that may be artistic but may not get clicked. A button that is clearly a button and separated from the textual content tends to get noticed and acted upon. 2) Take great care in design by creating a contrasting, standout color for the button. Remember, it is human nature to appreciate contrast. That is why significantly contrasted color works; witness kids with toys and bees with flowers and adults with limited attention spans who skim websites. Avoid grey buttons. Second person words are: You, Your, Yours. However, Joana Weibe explains in an excellent Copyblogger article that CTA buttons using this somewhat uncomfortable first person approach generated higher click-through rates. Today’s marketing means no longer can we simply set it and forget it. This applies to CTAs placed on your website. CTAs left unchecked for long periods of time can get stale and may need to be refreshed, changed out or abandoned. The only way to know for sure is to look at the data. Well, the big tip here is to make sure you have access to reliable data to prove whether CTAs are effective or not. Smart business owners have marketing software or analytics at their disposal to measure activity on their site. Measuring CTA conversion rates is an essential element in your marketing arsenal. 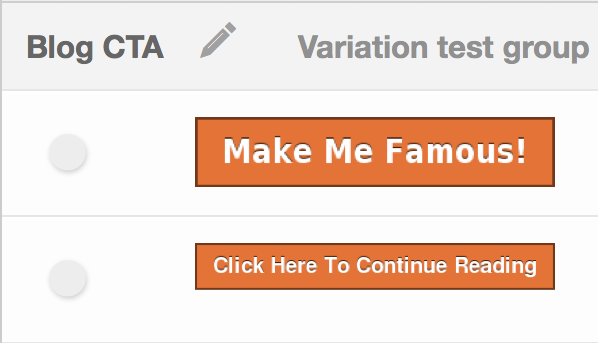 Periodically review CTA performance and remove CTA buttons or offers that aren’t measuring up. The best way to get data is to experiment with two different versions – this is often called A/B testing. By randomly offering up Version A to some site visitors and Version B to other site visitors, a marketing maven can then check the data to see which version does a better job of converting. Experiments can be simple and rewarding. Measurement provides actionable insight and it provides motivation to constantly improve. Can visitors clearly identify the primary call to action on each page of your website? Ensure engagement by intentionally creating a few buttons (don’t overwhelm with too many choices) that look like buttons, that clearly and colorfully stand out, and that use first person text within them. Don’t be shy about experimenting. Above all else measure results and keep tweaking your CTAs. And don’t forget to boldly get honest authentic feedback from your target audience by listening to what they have to say. We do this by creating compelling content for you to share, optimizing everything along the way, and measuring the results so that we’re maximizing your investment. Our goal is to help you turn your website into a marketing powerhouse.